White Tulip with a background of watery greens and blues accents the pale purple, white, blues and pale burgundy in the petals of the white tulip. A white tulip with dew drops creates an original botanical garden flower watercolor painting on board. My detailed realistic floral artwork hand painted by Laurie Rohner. Paper Size: 10 x 12.75 inches. Paper Type: Cold pressed watercolor board. Find a hand painted custom made painted flower nature box for your keepsakes. Flowers on every side of this one of a kind special keepsake painted wood flower box. Garden flowers wild flowers herbs and bees painted on every inch with pink coneflowers, iris, bee balm, teasel, daisies and mint name just a few of the wide assortment of colorful flowers. Inside the box stained a honey color. The wood box looks well worn for the distinct farmhouse decor. Detailed flowers in watercolor and ink. Made from solid pine and brass hinged, painted, stained and finished with danish oil. Waxed with bees wax. Bottom comes with cork buttons for protecting surfaces. Great size, large enough to hold your precious treasures or mementos. Slightly distressed but so cute. Thank you stopping by and if you like please share. My watercolor painting is an original botanical garden nature art painting of red poppies, wildflowers and garden flowers in shades of red and pinks with a touch of purple and a few white daisies. The title of this whimsical painting is Red Poppies by Laurie Rohner. Each flower is painted by hand and then I apply ink. This is a delightful whimsical botanical illustration and is affordable. New botanical flower illustration watercolor art, inspired by botanical gardens and nature hand painted and hand drawn by Laurie Rohner. New garden watercolor illustration ready for spring. 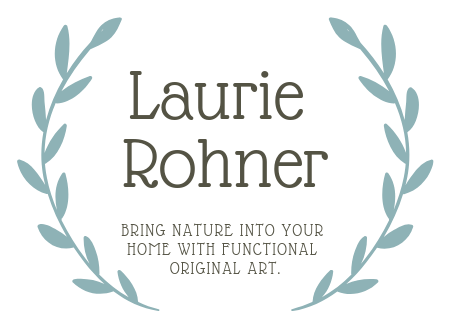 Poppies, pink hollyhocks, blue larkspur,Queen Anne Lace are just a few garden flowers hand painted in this botanical art original by Laurie Rohner. The flowers I chose for this painting range from spirals of hollyhocks and larkspur to bee balm and cornflower. Notice the bumblebee heading over to gather some more nectar. Garden flower watercolor shows my joyful gratitude. My gratitude starts with a garden in full bloom with the aroma of sweet scents and color that overcomes my senses. Yes gratitude does make me joyful. The sky is blue and the sun shines down on the garden filled with a few of my favorite flowers penned and painted in my illustration of garden flowers, dragonfly and a bee in watercolor and pen. There is a blush of blue sky hinting at a summer’s day. It is cheery and guarantees a better mood.